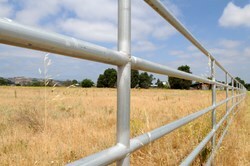 Our fencing and steel specialist team can assist you with all your security, farming, household and commercial fencing supplies along with a range of steel products including RHS, pipe, merchant bar and new and downgrade steel products. We also stock posts, barb and plain wire, fabricated fencing and accessories including Waratah, Whites Wires, Gallagher, Tru-Test and Austral Wire Products. Livestock handling equipment from Leicht's CIA and Arrow Farmquip can be found in store and we are also the Queensland distributor of Aprilla Grids. Our cutting edge team can also supply you with a variety of building products including structural and roofing material. The knowledge and dedication our team displays is reflected through hosting regular demonstrations and field days for our customers.